What’s the best part about swimming? It’s FUN! At The Lifeguard Store, we’re the web’s best resource for swimming pool toys, water slides, floatation devices and recreation equipment because we carry a huge selection of the best water games, toys for kids, rafts and swimming pool aids. Your patrons will have more fun in your pool with our products, and you’ll love shopping with us because we make customer service our top priority. Have more fun in the pool with recreation equipment from The Lifeguard Store! Floatation devices for swimming pools and swimming aids. Absolutely everything you need to give lessons or just have fun at the pool is right here at The Lifeguard Store. We have noodles and noodle storage bins. We have back floats, flat water-rolls and life vests. We have electric and manual air pumps, plus all the repair and replacement parts you need to stay afloat. Pool toys. The Lifeguard Store is your source for a wide selection of pool toys. Play water volleyball, basketball or football — or all three. Have fun dive competitions with disks and rings — or seahorses. 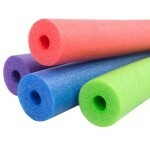 Have races with our Dive N Relay Sticks, or toss a couple of Water Bombs. Every day at the pool is more fun with toys! Swimming pool rafts and tubes. Who doesn’t love floating on a raft in the warm sunshine while sipping a cool drink? The Lifeguard Store carries dozens of rafts, floats and tubes, plus all the supplies you need to keep them inflated and patched. Check out our selection of towable tubes, speed tubes, double- and triple-hole tubes and inflatables with oars. Water games. Water games aren’t just a great way to stay in shape — they’re also fun! The Lifeguard Store carries water balls for water polo, basketball, football and volleyball, plus a basketball hoop that’s made just for the poolside. Water slides. Everybody loves a water slide! 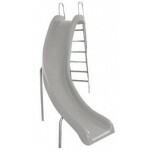 Bring poolside fun to the next level with a slide from The Lifeguard Store. We also carry an inflatable slide at a friendly price point that’s perfect for budgets of all sizes! Everything you need for your pool. From cleaning equipment to swimwear to deck furnishings, The Lifeguard Store is your source for everything pool. We offer free shipping on orders over $75, plus low flat-rate shipping on everything else. You get a guaranteed low price on everything you buy within 10 days of purchase. You can get free replacement shipping on exchanges — or a full refund — on new, unused merchandise within 60 days of purchase. We love them right back! Call, chat or email us and see for yourself. Have more fun with recreation equipment for your pool from The Lifeguard Store!